Zucchini is one veggie that people with gardens seem to have in abundance as the summer ends. While it’s always nice to slice them and toss them in a salad, or make (yet another) ever enjoyable zucchini bread, I was looking to make something a bit more on the healthy side. And then it hit me – zucchini, tomato and potato gratin! Not only is it a great way to layer the flavors of some yummy veggies (okay, and cheese, too) but it was super healthy as well. According to Wikipedia, “Gratin is a widespread culinary technique in food preparation in which an ingredient is topped with a browned crust, often using breadcrumbs, grated cheese, egg and/or butter. Gratin originated in French cuisine and is usually prepared in a shallow dish of some kind. 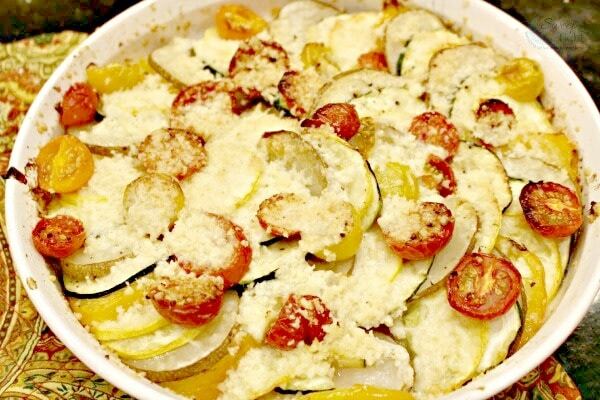 A gratin is baked or cooked under an overhead grill or broiler to form a golden crust on top and is traditionally served in its baking dish.” Here, I’ve used summer vegetables to make an all vegetable gratin. I used olive oil, but you can use butter. I opted out of using egg, as it wouldn’t have complimented this dish. I just wanted each vegetable to come through and taste as it should – like summer! 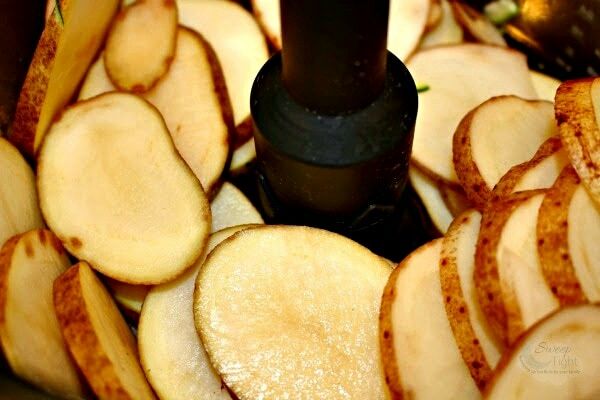 If you have a food processor you can make sliced potatoes, or whatever else you need to slice, for that matter, in NO time! I sliced about 6 medium baking potatoes here. My first choice was to use the creamier variety, a red potato. But, use what you have, right? Using the same technique as with the potatoes, I sliced the zucchini and yellow squash. I cut the red and yellow tomatoes by hand. I’m sure going to miss these nice home grown tomatoes from the summer! *special note for both types of gratin. Times will vary depending on how thick your vegetables are sliced. I used my food processor to cut uniform 1/8th inch slices, so my timing reflects a proper cooking time for that size. If you have a thicker cut on your veggies, you will need to check for proper tenderness in the gratin. Drizzle olive oil inside a shallow baking dish making sure the oil coats the sides. 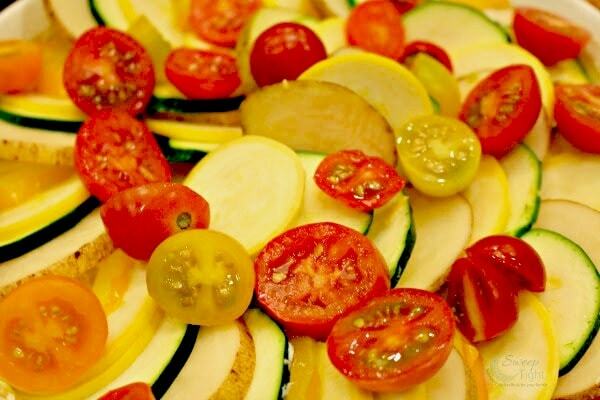 Layer in the sliced zucchini, yellow squash and the potato alternating vegetables in a circular pattern until reaching the center of the dish. Top gratin with sliced tomatoes. Pour about two tablespoons of water in the gratin dish so veggies can steam just a bit from the bottom up while cooking, but not much more than that, or they will not brown properly. Drizzle about 2-3 tablespoons olive oil on top of the fully assembled dish. Check to see that top is brown with a light crust. Cool for about 10 minutes before eating. This is where you start layering those pretty veggies! Just alternate and move around in concentric circles, pretend that you are waaaay creative. Don’t tell anyone how easy it really is! It is at this point that I added the kosher sea salt, fresh ground pepper, and the grated Asiago cheese. Some freshly chopped herbs would also be very nice here, too. And, here is another type of gratin for you! 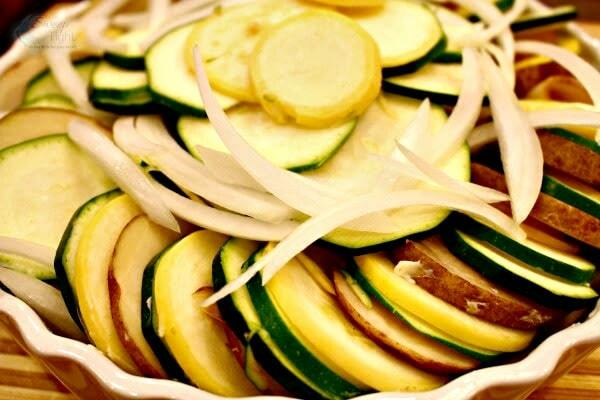 Zucchini, potato and sweet onion. This one has goat cheese to really flavor it up! Tuck slices of sweet onion in and around the gratin, and place a few on top. After it is all baked, this dish makes a great lunch with soup or a perfect side at dinner. 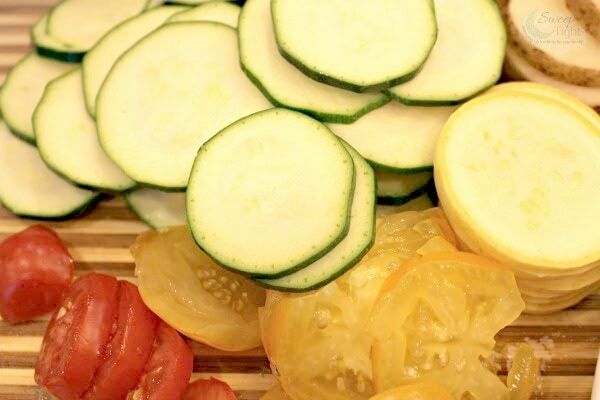 You can change up any of the veggies you like, the key is to slice them all the same thickness so the dish can cook to the right tenderness throughout. It is easy to change the cheese, pick a favorite! Toss in a handful buttered breadcrumbs with the cheese to make more of a crusty/crumbly topping. Hmm. With fall right around the corner, maybe I’ll try some carrot and butternut squash next time? What do you do with leftover zucchini or summer squash? I’ve never tried anything like this before, but love that it is an extra way to pack extra veggies in! My husband loves zucchini, so I know that he will be happy once I make this. That looks amazing and needs to be added to my menu plan next week! Potatoes, Tomatoes, and Zucchini OH MY! This looks delicious! I love how healthy it is, too with all those vegetables. Of course, I’m thinking this might be awesome in a crock pot, too! Oh that sounds amazing! I love dishes like this, doesn’t even feel like you are eating veggies! What a delicious combination. I would love to incorporate more veggies into my kid’s diet and this looks great. Both gratins look and sound delicious, I would love to try them both. I would use left over zucchini or summer squash to make a vegetable stew. Thank you for sharing this recipe post. 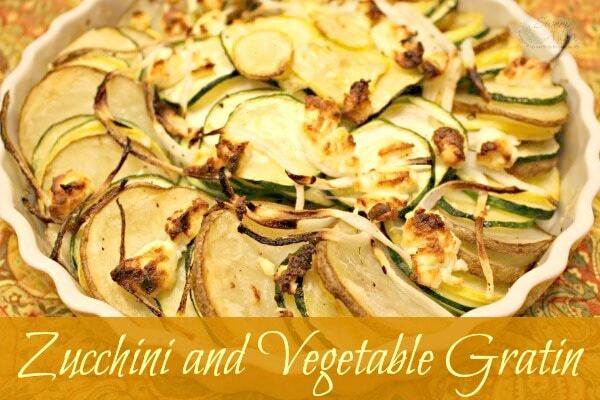 We love Zucchini in our house and this looks delicious! Coming over from Show Stopper Saturday! This looks fabulous! I need to add more veggie dishes like this to our meals. Thanks for sharing! Great idea for zucchini. 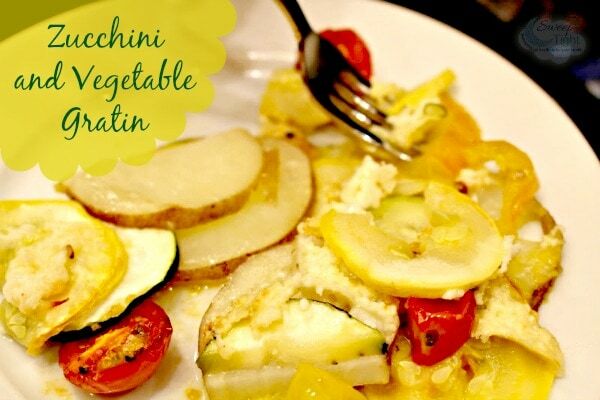 Love the Gratin idea!